EU 2020 highlights that the EU and Member States should enable SMEs to turn environmental challenges into opportunities. Green growth can offer significant benefits, however as stated in the Small Business Act (EP 2014/2209 INI) policy makers need to fully understand the potential of the green economy, whilst being aware of the barriers that SMEs face regarding the greening of their products, production processes, business practices and services. The circular economy is a key conceat of the green economy, based on optimising systems rather than components, away from ‘Resource to Waste’ to resilient and productive circular systems. Strategic alliances between support organisations such as Ellen MacArthur Foundation, McKinsey Company, etc and multinational enterprises have been at the forefront of circular economy exploration and application. SMEs rarely have the same access to knowledge networks to stay up to date with new technologies, or communicate with potential clients or investors. It is therefore key to understand how SMEs can exploit the opportunities of circular value chains. 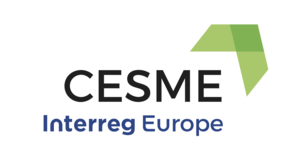 The CESME project developed in the frame of Interreg Europe programme, addresses SME inclusion in the circular economy, by interregional meetings identifying good practices aiming to examine how best regional and local authorities and business development agencies can improve relevant policy instruments and design support packages to assist SMEs to enter the circular economy. Through the creation of a return on investment analysis quantifying the economic and social benefits of circular value chains as well as a white book guiding SMEs step by step into circular economy, the CESME partnership hopes to introduce new circular initiatives targeted SMEs. These initiatives will be implemented and tested for feedback and adaptation in order to be replicable tools across EU as well as monitored against their expected impact. Finally, this will lead to the improved effectiveness of the policy instruments addressed by the project partners. CESME White Book on Circular Economy is an effort to capitalize on previous experience and to present the lessons learnt and the experiences gained during the CESME project in a coherent and systematic way. An introduction providing a short description of the project, its aims and results, and presenting the project partnership. Circular economy policies and framework, such as EU, national and regional policies. Major themes and topics concerning circular economy for areas of interest (e.g. built environment, textiles, packaging, etc.). This Chapter also provides information on the barriers of implementation and relevant stakeholders. A presentation of best practices collected during the project. The Action Plans developed in the context of the project by each participant country and region. The tools developed for green profile assessment and return on investment developed, also, during the project. The CESME White Book on circular economy is a collaborative effort of all partners.